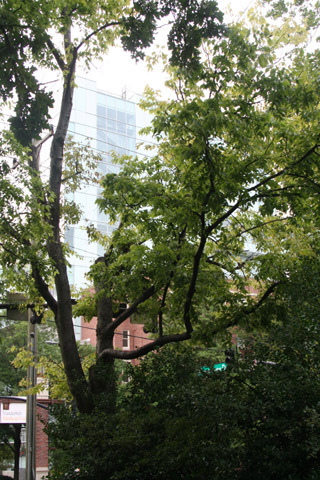 This tree is located in the northwest corner of the greenspace between the Peabody Library and 21st Ave. S.
It is not always possible to assign hackberries to a particular species because they hybridize and can have intermediate characteristics. However, this tree has characteristics typical of Northern hackberry ( Celtis occidentalis ). Northern hackberry leaves are broader and more toothed than the leaves of southern hackberry ( Celtis laevigata , seen earlier on the tour). The fruit of northern hackberry is dark red or blackish when mature, in contrast to the more orange-red fruit of southern hackberry. This particular tree produces fruit abundantly. Northern hackberry also has the smooth, gray bark with lumps similar to that of southern hackberry. It is more typical around Nashville to find hackberries displaying the C. laevigata characteristics because we are near the southern edge of the C. occidentalis range. But as this tree illustrates, C. occidentalis types can be found in this area. This organism is a living specimen that is part of the  Vanderbilt University Arboretum  with the local identifier 1-470.